Detroit has been bankrupt for years. It simply refuses to admit it. Detroit's schools are bankrupt as well. A mere 25% of students graduate from high school. Yet, in spite of hints and threats from mayors and budget commissions, and in spite of common sense talk of bankruptcy, Detroit has not pulled the bankruptcy trigger. In a futile attempt to stave off the inevitable one last time, Mayor Bing's latest plan is to cutoff city services including road repairs, police patrols, street lights, and garbage collection in 20% of Detroit. City officials suggest this will not shrink the size of the city. Perhaps it won't shrink Detroit on Google Maps. However, Bing's plan would effectively surrender 20% of the city to gangs and the homeless. Would you want to live in one of the gang war-zones that his plan would create? Would you want to live in a bordering neighborhood or in a bordering city? Regardless of your answer, Bing's plan cannot and will not work and I believe Detroit will, sometime in 2011, file for bankruptcy. If so, expect massive turmoil in municipal bonds. More than 20% of Detroit's 139 square miles could go without key municipal services under a new plan being developed for the city, with as few as seven neighborhoods seen as meriting the city's full resources. Mr. Bing's staff wants to concentrate Detroit's remaining population—expected to be less than 900,000 after this year's Census count—and limited local, state and federal dollars in the most viable swaths of the city, while other sectors could go without such services as garbage pickup, police patrols, road repair and street lights. Karla Henderson, a city planning official leading the mayor's campaign, said in an interview Thursday that her staff had deemed just seven to nine sections of Detroit worthy of receiving the city's full resources. She declined to identify the areas, but said the final plan could include a greater number. "What we have found is that even some of our stronger neighborhoods are at a tipping point with vacancy," Ms. Henderson said. "Vacancy adds to blight and blight is a disease that takes over the whole neighborhood. So the sooner we can get those homes occupied, the better for the city." Officials bristle when their efforts are described as downsizing, saying their aim is to repurpose portions of the city, not redraw its borders. "We will not be shrinking the city," Ms. Henderson said. "We are 139 [square] miles and we'll stay that way." Of course the Mayor's office did not say they would abandon sections of the city to gangs. But how the hell can repurposing as described above possibly mean anything else? What's next? Barbed wire? Oh wait a minute, Detroit already has tried that. Razor-wire too. Here's a picture of Detroit's clearly abandoned repurposed Michigan Central Train Depot. Image courtesy of the Journal and the AP. 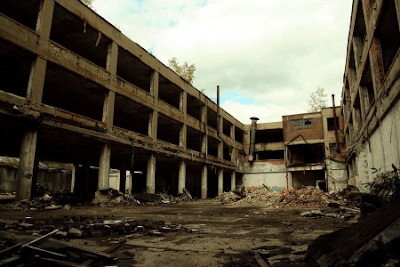 The City of Detroit has failed for nearly four years to send property tax bills to the owner of the Packard plant, costing the city badly needed cash. 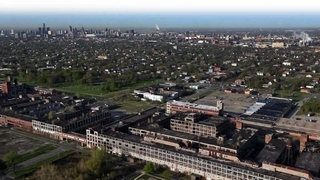 At 3.5 million square feet, the plant is by far the largest derelict property in Detroit. It wasn't until the Free Press began making inquiries last week that the city's assessor's office returned the property to the tax rolls -- with an assessed value of nearly $1.6 million. The change came nearly four years after a Michigan Supreme Court decision prompted the city to surrender the century-old plant to Bioresource, a company whose last listed corporate representative is a convicted drug dealer. Last week, less than 18 hours after a reporter questioned why the property was listed as city-owned, the assessor's office changed its status to "taxable." The property's assessed value ballooned from almost nothing to nearly $1.6 million. Robin Boyle, professor of urban planning at Wayne State University, said the error underscores "just how challenged the city is in dealing with the fundamental task of title, control, oversight and follow-through" with property throughout the city. "To me, that is a fundamental problem that leaves Detroit in a consistently weakened position. It can't even do the basics," Boyle said. "This is a huge piece of real estate, and yet, there's still confusion." 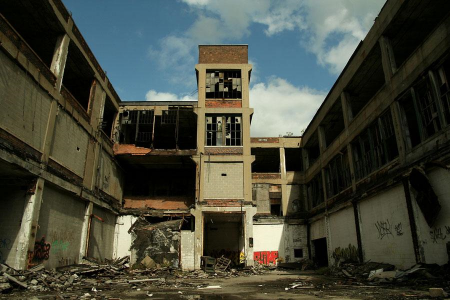 Although only one tenant remains on the property, the plant is not entirely neglected. Scrappers prowl it for metal. Graffiti artists decorate its walls. Someone perched TV sets atop pillars standing at least 15 feet tall. And it can all be yours for $13 million. David Wax, senior associate with Burger Easton & Co. in Farmington Hills, has listed the property for sale for a couple of years. He said there was a good deal of interest before the world economic crisis and before steel prices collapsed, making the Packard plant less attractive to buy and then demolish for its metal. "For 13 years it's been vandalized, raped, burned, stripped of anything of value," Wax said. And on any given day, he said, you can hear "people with hammers and cutting torches cutting steel out of the building." The Business Insider has fantastic set of images of the beautiful $13 million Packard property. Here are a couple of those images. Now that the building has been put back on the active tax rolls to a convicted drug dealer, this is the sequence of events I imagine would transpire were Detroit to stay on its existing path using Bing's plan as the roadmap. 5. Detroit will repurpose the Packard plant with the same success as depicted in the Michigan Central Train Depot image. Now’s the time to cast off collective bargaining agreements and introduce school choice. ‘Am I optimistic that they can avoid it . . . ? I am not.” That’s what retired judge Ray Graves said this week when asked whether the Detroit public schools, which he is advising, would be forced into bankruptcy. Facing violence, a shrinking student body, and graduating just one out of every four students who enter the ninth grade on time, the city’s schools have been stumbling for years. Now they face a seemingly insurmountable deficit and are expected to file for bankruptcy protection at about the time that students should be settling down in a new school year. As embarrassing as such a filing would be, it also may be the only thing that can force the kinds of changes Detroit schools need—as the financial turmoil is just the latest manifestation of a system in terminal decline. Detroit is like many urban school districts—large, unwieldy and bureaucratic, with a powerful union that makes the system unable to adapt to changing circumstances and that until very recently had an indulgent political class that insulated it from reform. That insulation came in two forms. The first was neglect. Mayor Kwame Kilpatrick spent several years distracted by a scandal stemming from his affair with a staffer. He resigned last year, pleaded guilty to obstruction of justice, and was sentenced to four months in jail. Had he been an effective mayor, he might have also been a powerful advocate for students. The other insulating force was a conscious decision to wall off Detroit from charter schools. In 1993, Michigan’s legislature made it difficult to create new charters in Detroit by declaring that only community colleges could authorize charters for primary and secondary schools in “First-Class Districts”—defined as those with more than 100,000 students. Detroit was the only First-Class District. In 2003 the state, under pressure from the Detroit Federation of Teachers, turned down a gift of $200 million from philanthropist Robert Thompson that would have established 15 charter schools in the city. Those charters are needed today. The net result has been a school system that’s been coming apart as the teachers union has dug in its heels. In 2006, the union illegally went on strike, killing a plan to force teachers to take a pay cut to balance the system’s books. Read that again. Under pressure from the Teachers' Union, Detroit turned down $200 Million. That was in 2003 dollars. Wow. No doubt the union "did it for the kids". For more on the appalling behavior of Detroit's teachers' unions please see Detroit Public Schools (25% graduation rate) teachers unions opposing highly qualified volunteer teachers. It is time to kill collective bargaining for public unions, every one of them, and nation-wide, not just Detroit. Detroit has hit the end of the line. It's budget deficit is between $446 million and $466 million (28% to 29%) of $1.6 billion with few ways other than drastic cuts in wages and benefits to address the problem. If unions will not give in (and they won't), Detroit Faces Bankruptcy. The deterioration of the economic base of the city has accelerated. There were an estimated 81,754 vacant housing units (22.2 percent of the total) in Detroit before the recession; that number increased to an estimated 101,737 (27.8 percent of the total) in 2008. The average price of a residential unit sold in the January through November, 2009 period was $12,439, down from $97,847 in 2003. Remaining businesses and individuals are challenging property tax assessments on parcels that have lost value and, in some cases, cannot be sold at any price. More than half of employed city residents work outside the city limits; the metro area has the highest unemployment rate of the 100 major metro areas in the U.S. The only legitimate solution for Detroit is to shed pension obligations, privatize everything it can including the fire department, and dump unions contracts en masse. 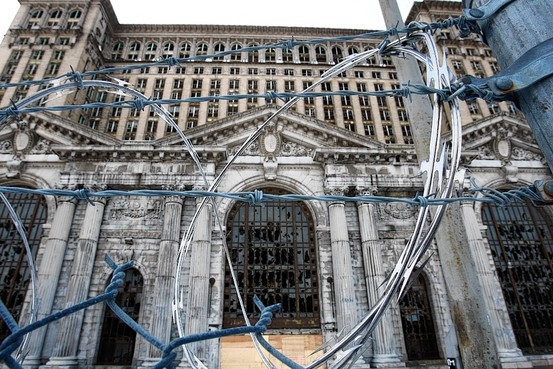 Since those items can only happen in restructuring, Detroit should openly embrace bankruptcy. Detroit, the largest U.S. city whose debt is rated below investment grade, warned investors of the risk of bankruptcy as it prepares to sell $250 million of bonds to help close its budget deficit. The city told bondholders in a March 2 preliminary offering statement that while it hasn’t taken steps to reorganize under Chapter 9, it may have few other options if its financial condition worsens. Detroit officials also detailed the steps they would have to take should bankruptcy become necessary. “We are still in a financial crisis but insolvency isn’t on the horizon or on the agenda at this time,” Mayor Dave Bing said in an e-mail from his spokesman, Dan Lijana. The total deficit this year is estimated at $280 million. Bing Still Pretends - How Long Can It Last? For reasons unknown, Bing just cannot do what is right. He will not come flat out and say what everyone in their right mind knows - that Detroit is fiscally and morally bankrupt and so are its schools. Instead, on December 10, 2010 Detroit Borrows $100 Million for Police and Fire Headquarters. Detroit, whose population has dropped by half since 1950, borrowed $100 million to turn the MGM Grand Casino’s former site into a headquarters for the police, fire and emergency-services departments. The city sold so-called Recovery Zone Bonds authorized under the U.S. economic-stimulus plan, borrowing at 4.55 percent, the city said in a press release today. The bonds, with the longest term maturing in 2035, were sold through the Michigan Finance Authority by investment banks led by Siebert Brandford Shank & Co., according to data compiled by Bloomberg. “The financial markets believe in what we’re doing to bring fiscal responsibility back to Detroit,” said Mayor Dave Bing, in a prepared statement today. So-called recovery zone bonds were included in the economic-stimulus package signed by President Barack Obama last year to help expand the economy of areas with poverty and unemployment. They’re a type of Build America Bond that comes with a 45 percent interest subsidy rather than 35 percent rate under the Build America program, which expires Dec. 31. The bonds were rated A1, or fifth highest, by Moody’s Investor’s Service and AA-, or fourth highest, by Standard & Poor’s. Note the ridiculous rating of those bonds by Moody's and by Standard & Poor’s. If the Federal government is backing those bonds, then they are AAA. If not, they are junk. There is no in-between. Thankfully, the extremely ridiculous Build-America-Bond program will expire on December 31. When it does, no one in their right mind will lend Detroit money, and that at long-last will mean "lights out" for Detroit. A new Republican governor takes over in Michigan next year, complete with a new Republican legislature. I believe Governor-Elect Rick Snyder will be amenable to fixing what ails Detroit and numerous other cities in Michigan. Should Mayor Bing not seek bankruptcy assistance, I propose for Governor Snyder to force Detroit into bankruptcy. It is the only hope Detroit has. Mayor Bing is clearly in over his head. Governor Snyder would be a hero if he can turn Detroit around, and outside of bankruptcy that appears impossible. Thus, forced or not, I believe Detroit will file bankruptcy in 2011, the state will accept it, and public unions will be forced to accept massive concessions in bankruptcy court. Look for massive turmoil in the municipal bond market as a result. Over the past month, the troubled Detroit Fire Department has found itself trying to convince an angry public that it has not abandoned them. The latest debacle was a windblown inferno that torched at least 70 homes across the city. It was so bad that an 11-year-old dressed in a T-shirt and sneakers was pulling hose for the overwhelmed Fire Department. Firefighters from Warren, Dearborn and Grosse Pointe were called in. Mayor Bing passed it off as a natural disaster. But even before the fires, the competence of the department was called into question after a string of blunders in the past month related to its ambulance service. In August, firefighters from Engine 50 pulled two victims from a burning building. They requested two ambulances. No units available, they were told. A man cut off his toes with a lawn mower. Again, no unit available. Most shocking, perhaps, occurred when a building collapsed on six firefighters, half of whom were taken to the hospital in squad cars and fire trucks because there were no ambulances on the scene. If that is how people in uniform are treated, imagine what it is like for the average citizen in the dark of night. Fire Commissioner James Mack Jr., who also oversees the EMS system, said the morning after the fires the department's problems aren't a matter of mismanagement but poverty. "Everybody knows we are under budget constraints, so with those budget constraints we are maximizing the equipment that we have and the manpower that we have," Mack said. Some city leaders aren't buying it. Consider that today the Fire Department budget is $175 million, more than it was five years ago, even after adjusting for inflation. "What's wrong with the city?" asked City Councilman Gary Brown, who believes there is room to cut in the Fire Department's $175 million budget. "A vacuum in leadership. It's not a matter of funding. I suspect it's mismanagement." Brown asked Mack -- who served for six years as the second deputy commissioner under disgraced former Mayor Kwame Kilpatrick -- to deliver within 90 days a comprehensive plan to bring the ambulance response time down to a targeted eight minutes, which is the national standard. That was 170 days ago and Brown is still waiting for the report. The article tells many sad stories of people who died waiting for emergency services. Please read it. I repeat my claim: Detroit cannot be saved from within, bankruptcy is the best hope.